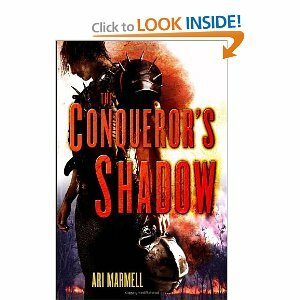 Tonight on Radio of Horror Author Ari Marmell author of The Conqueror’s Shadow. This is a fantastic Fantasy book with blood and gore for any fan of sword and barbarian books. If you like Dungeons and Dragon’s then you will love this book as well. Funny thing is the guy worked on some D&D stuff. The tells the tale of a warlord who just wants to give it up and not fight anymore. He settles down with a family but his horrible past comes back to haunt him. I am reminded a lot of the more and comic book A History of Violence. When one man with such blood in his past just wants to leave it behind him. This is a great book and well worth picking up. The character development is fantastic and unlike other fantasy novels you don’t need to read twelve other books to read this one. Before and after Ari’s interview we will play more Nightmare on Elm St music.